Moving up. And moving on. This week, I attended end of year ceremonies for two of my boys. One from nursery and one from elementary school. Now I know these don’t really count as graduations, more like transitions, or changes of address, but they are momentous in their own right. Especially for me. After eight years, my time in nursery school has finally come to a close. On one hand, I am so happy to be out of those halls where I was constantly tripping over people who came up to my knees, and ‘ohhing’ and ‘ahhing’ over artwork that looked like a two year-old did it. Oh, right. But on the other hand, I’m miserable. My youngest baby is growing up. We’ll no longer have our days off together. He’ll become part of the larger system, one not as accessible to me. I look back at pictures of him when he first entered. A baby, really. I mean he still is a baby now, but not really. Even though he still adorably whispers his secrets from his ear to mine, I can’t ignore his maturity, his humor, his knowing, third kid savvy. Even though it’s time for the next step, I want to pick him up, hug him to me and not put his feet back on the ground. If he can’t walk, he can’t step. Right? 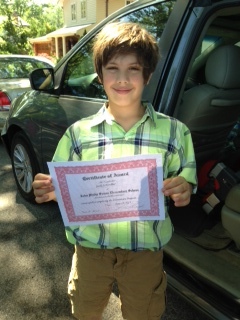 My 10 year-old is moving on as well – to middle school. I vividly remember putting him on the bus for Kindergarten. It was traumatic for both of us. Even now, I could cry thinking about it. Okay, I am crying. But that child who struggled to get on the bus, now rides in the back with his posse and loves it. The baby who wouldn’t get up to sing at his Kindergarten moving up ceremony, the only child in the grade, took the stage as a third grader and performed a lead role in the school play. It is up there with the best moments of my life. The child who sat shyly, never even asserting himself to go to the bathroom, holding it all day, now sometimes needs reminding to sit in his seat and stop talking to his friends. The child who never asked for play dates, so happy to just be home, now has a great group of buddies and hangs out with them regularly. He has grown so much, but he also is still so much that baby. If he weren’t so heavy, I’d pick him up along with my five year-old and eight year-old, to keep us all from taking those next steps. I want to bubble all my boys up and keep them tied to me like balloons around my wrist. If I’m honest, I don’t really want to let them fly. I’ll give them some string, but I feel much better with them tied to me. But of course, that’s not realistic. I can’t stop time, any more than I can’t stop progress. They march on, just like my babies proudly making their way up to the podium. We’re moving on up, and it’s time for me to get with the program. Hand me the tissues. Okay, so he didn’t technically graduate, but he did finish 2nd grade. And come on, look how cute he is. Posted in Crap that makes me eat too much ice cream, Every Day Scoops and tagged graduation, growing up, moving up ceremonies, school's out for summer. Bookmark the permalink. thank you. and thank you so much for reading. Love reading about your love for your family. Those little promotions in our kid’s lives can be bittersweet. You’re an amazing mama from what I can tell. Thanks for sharing that with me(the world). 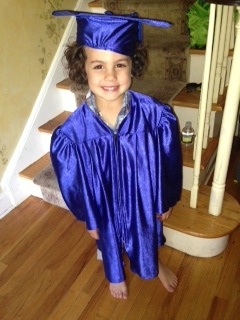 I love that teeny tiny cap and gown! I know!!! It’s sooo cute, right?!! That tiny cap and gown just kills me! 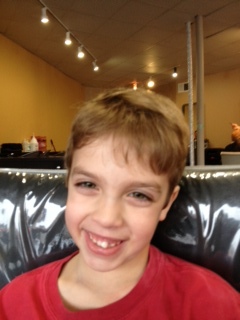 …and I adore the other two boys! I get this totally. You’re such a loving mama! Oh no! *Sniff* Time-passing-babies-growing-up – – – GAH! Makes me teary-eyed. Not that I have any babies, but I can IMAGINE having babies, so I can imagine all you must be feeling!